Which Type of Grill Works Best for You? From gas and charcoal to ceramic and pellet, choosing a grill requires an informed decision. Find out which one fits your cooking needs, and learn about area experts who can help you throughout the buying process. The Black Olive grill is pellet-driven and ceramic; the Big Green Egg ceramic grill uses natural charcoal. Are you happy with your grill? If the answer is “no,” you might want to make a change. Summer is a great time to buy one of the many unique types available. Here’s a primer on some of the most popular models. There are many ways to heat a grill, including gas, charcoal, ceramic and pellet. Benson Stone Co., 1100 11th St., Rockford, carries all of them in brands such as Weber, Saffire, Big Green Egg and Memphis. Gas grills use natural or propane gas, and the tank must be refilled at regular intervals. However, it’s possible to permanently mount a natural gas grill into your patio and connect it to your home gas line. That way, the chore of continuously filling up the tank disappears. If you employ the use of a deflector plate, gas grills easily spread heat and keep meat juices from dripping, which ultimately helps food to retain flavor. Charcoal grills are similar to gas grills, but don’t have deflector plates. Saffire brand charcoal grills are ceramic, dome-shaped, Kamado cookers. According to Obee, many customers prefer charcoal grills because they enjoy a classic charcoal flavor. One type is a lump charcoal grill. Using 100 percent natural wood with no additives, pure heat cooks the food and leaves almost no ash. “I recommend owning both a gas grill and a charcoal grill, as they help with different cooking needs,” says Obee. 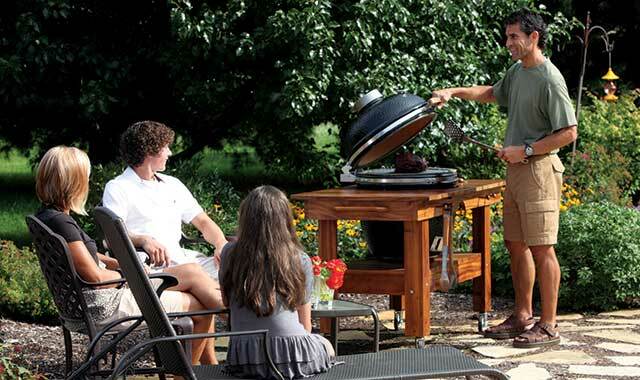 Pellet grills like the Memphis brand use flavored wood pellets during cooking. “You set the temperature for the inside part of the oven, and the grill regulates itself based on how many pellets come in and how fast they burn,” Obee explains. Both gas and charcoal grills are available from The Fireworks, 4437 E. State St., Rockford, in brands such as Vermont Casting, Broilmaster, Weber and Bayou Classic. To use a gas grill, simply turn on the propane tank and light the burner. All of the grills sold at The Fireworks have igniters to light the burners, Kleinhans says. After that, you can adjust the temperature of the grill to fit the desired cooking temperature. On the other hand, charcoal grills only require you to put the charcoal in, light the grill, and wait for the coals to turn white hot. “It usually takes about 20 minutes to get hot enough for grilling,” says Kleinhans. The Big Green Egg grill looks exactly like its name implies – a big green egg. As a ceramic cooker that runs on natural charcoal, it also serves as a pizza oven, baking oven and smoker. Since the ceramic captures the desired temperature, the food cooks evenly. The charcoal can be used over and over, which means less stress and fewer charcoal purchases. The original Big Green Egg company has been in business for more than 35 years. The Traeger Wood Pellet grill is also available at Advanced Chimney Systems. Unlike the Big Green Egg, the Traeger is an auger-driven system, and is known as the original pellet grill. More than 10 pellet flavors are available to contribute to the food’s taste; common flavors include apple, cherry, hickory and mesquite. If you can’t decide whether you want the Big Green Egg or the Traeger, you can opt for the best of both worlds. “We also carry the Black Olive grill, which is a combination of the two – a pellet-driven ceramic cooker,” says Kraus. With such a wide selection of grills available, you can easily find the one that will best fit your cooking needs. Be sure to ask plenty of questions when you go shopping. The experts at locally owned retail establishments are eager to help you learn the fine points of your options. This entry was posted on Thursday, August 14th, 2014 at 11:59 am	and is filed under Home & Garden. You can follow any responses to this entry through the RSS 2.0 feed. Both comments and pings are currently closed.